Katia Bombay Summer Cardigan - This summer we're looking for light, breezy and colourful items to add to our wardrobe. And what fulfils our desires better than this pretty pattern? We crocheted this cute Katia Bombay summer cardigan for the warm days to come. 10 x 10 cm = 20 sts. and 8 rows. With crochet hook no. 4 ch. 97 - 105 - 113 - 121. Work 2 rows of sc. Continue with crochet hook no. 4 in fantasy stitch according to pattern chart A. At a total height of 54 - 55 - 56 - 57 cm cast off and weave in the ends. Right FrontWith crochet hook no. 3 ch. 49 - 53 - 57 - 61. Work 2 rows of sc. Continue with crochet hook no. 4 in fantasy stitch according to pattern chart A - B - A - B. Start with the neckline when your work measures 48 cm in total. 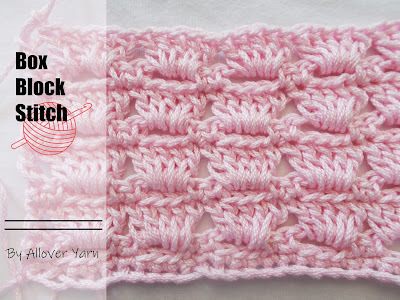 Work the right side according to pattern chart C. Continue in Fantasy stitch. For the shoulder, at a total length of 54 - 55 - 56 - 57 cm cast off all and weave in the ends. Work like the right front, only in reversed shaping. With crochet hook no. 3 join the shoulders and the sides with a zig zag stitch = insert the hook in the first part, then in the second part and work *Sc. 1, ch. 2*, repeat from *to*. For the armholes leave on each side 22 - 23 - 24 - 25 cm open. With crochet hook no. 3 work around the armhole in rounds. Work 4 rounds of 60 - 64 - 66 - 68 sts. and close each round with a sl.st. With crochet hook no. 3 sc. 72 over the length of the right front, around the neckline sc. 56 - 59 - 62 - 65, sc. 72 over the length of the left front = you'll have 200 - 203 - 206 - 209 sts. Work another round this way. Divide in the 3rd round 5 button holes over the total length of the right front. For each button hole, ch. 3 and skip 2 sc. of the previous round. After working 4 rounds cast off and weave in the ends. Attach the buttons.